Since its debut at the very start of the awards season circuit, Barry Jenkins’ Moonlight has stunned many by quickly joining the ranks of La La Land and Manchester By The Sea to become one of the top frontrunners for the Best Picture Oscar. The reason for its surprise strength in the current awards season thus far is because it does not contain what Academy members usually look for in a true crowd-pleaser of a film; instead, it has an all-black cast with a director whose only previous film Medicine for Melancholy never even received a UK release, it blends heavy issues like poverty and sexual identity in a story about a young boy growing up, and it’s shot almost like an arthouse film that happens to have a loosely-flowing narrative within it, kind of like a Terrence Malick film if it had an actual plot. It is, to be blunt, a far cry from what Oscar voters are usually comfortable with voting for their top favourites of the year, and you can call its surprising awards strength a desperate reaction to #OscarsSoWhite all you want, but at the end of the day the joke would be on you, because it also happens to be a really great movie. Split into three parts, the film follows a young black man named Chiron through several stages of his early life. The first part takes place when he is a child (Alex Hibbert), wherein we learn that he lives such a terrible existence with an abusive crack-addict for a mother (Naomie Harris) and constantly being bullied at school, that when a lowly drug dealer named Juan (Mahershala Ali) finds him and takes him under his wing, he ends up being perhaps the best parental figure anyone could ask for. The second part, which sees Chiron as a teenager (Ashton Sanders), explores his growing inner torment as the bullying at school gets even worse, his mother descends further into addiction, and his strong attraction to his best friend Kevin (Jharrel Jerome) soon overflows into a beautifully paced scene of sexual tension on a beach. Finally, we see an adult Chiron (Trevante Rhodes) at last confront his feelings head-on, having suppressed his true identity through a hardened drug dealer image and persona, and yet still secretly pining for his one true love, Kevin (André Holland). A true original – although it is based on a previous script/play entitled In Moonlight Black Boys Look Blue by playwright Tarell Alvin McCraney, itself based on his own experiences as a young gay black man – Moonlight constantly avoids cliché and stereotype to present a story that is undeniably human and raw in its emotional impact. From the first moment we meet Ali’s Juan, we think he’s going to be this Fagin-type figure who acts all nice to this impoverished and vulnerable kid but later reveals his true colours when he gets him to do some dodgy things with his drug-dealing enterprise. But instead, Juan turns out to be a pretty cool guy; he’s funny, likable, and genuinely cares for this neglected young boy, with no ulterior motives whatsoever other than the fact that he just happens to be a drug dealer on the side. He is one of quite a few characters in the film that is expertly humanised instead of being just another cardboard cut-out of a familiar trope, and Jenkins plays with audiences’ expectations right from the very first shot by initially hinting at characters we’ve seen over and over, but brings something new to them that make us feel we’re watching these clichés for the very first time. Its heavy themes and their executions also make it something far more than just the combined LGBT and POC version of Boyhood. As Chiron becomes more and more drawn to his feelings for his male best friend, it also causes him to become more isolated and fearful of the outside world, especially as the bullying at school gets worse and worse, and his mother becomes ever more aggressive with her desperate need to fuel up on more crack, even going so far as to take hard-earned money away from her own son to pay for it. The reasoning behind containing his true sexual identity sadly makes far too much sense, as the rest of the world has been so unforgiving to him as he’s growing up, so according to him how on Earth would they react if people knew he was also gay? He is a figure that reflects so many people out there who are fearful of coming out, if only for the reason that they don’t know how those they love would react, whether in a loving way or if they become disowned as a result. Even though we as a society are becoming far more accepting of the LGBT community, there is still rampant homophobia out there which can prevent some people from truly expressing themselves, something that Moonlight reflects all too realistically through some harsh writing and edgy direction by the multi-talented Jenkins. He also directs his actors to some of their best work, period. Though he is not on-screen for too long, Ali is such a charismatic presence that you’re instantly wanting this guy to be your own father figure; while Harris is terrifyingly cruel but also extremely tragic as a neglectful mother whose life choices fail to provide her own son with the support he needs especially as he’s going through some rough times himself, and she is absolutely stunning here. The three actors playing Chiron at different ages deserve shout-outs too, with young newcomer Hibbert being a timid and curious presence, Sanders having the natural talent to quite possibly become a future star, and Rhodes having some great scenes to fully flex his acting chops. It’s a perfectly acted, perfectly made, and perfectly timely film that explores one’s lack of confidence with their true self, one that should be recommended viewing for anyone, regardless of their sexuality. 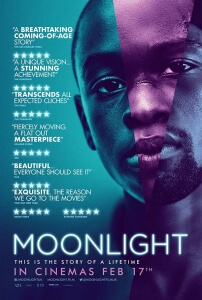 Moonlight is a powerfully told tale of a young man’s struggle with his own sexual identity, one that includes timely characters, excellent performances and edgy themes that are handled with such heart and care.